During this gastronomic holidays, you will have the chance to combine language training with a taste of the unique Basque cuisine. By mixing an intensive Spanish course, a wine tasting, a tapas tour, and a “Gastropote” at the fresh food market you will get a full immersion into the local lifestyle. Come to San Sebastián and see how, beyond the concept of sun and sand, the city offers a varied program of exhibitions, concerts, popular fiestas, sports, and international events. You will live in an apartment with one or two Spanish people, who are studying or working. You will have your own bedroom and use of the kitchen, bathroom, and living room. This option allows you contact with Spanish people while maintaining certain independence. Bed sheets and towels are provided. You will be made to feel perfectly at home living with a family. This makes for a wonderful experience. Half board includes breakfast and dinner. The accommodations are located in different areas of San Sebastián and in general, you do not need more than 15 minutes by bus to the center or the school. These apartments are only available in the summer season. You share an apartment with students from other countries and Spanish people. Flats provide an average of three to five students with single or double bedrooms and shared use of the kitchen and bathroom. This is a good opportunity to live with a variety of people and share different cultures. Bed sheets and towels are provided. For a successful stay, you need friendly and comfortable accommodation. Tandem San Sebastian carefully selects and regularly visits each apartment. All rooms are single unless otherwise requested. You can also reserve double rooms if you come with a friend. Rooms are reserved from Sunday afternoon to Saturday morning. With this gastronomic experience pack, you can combine language training and the opportunity to get to know and taste the unique Basque cuisine and the world famous pintxos, also known as Basque tapas. The pack consists of three top-experience activities for foodies. 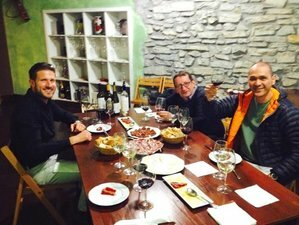 On Tuesday, you will enjoy a guided visit of San Sebastián with a pintxo tour from 7:00 to 9:00 p.m. On Wednesday, from 6:00 to 9:00 p.m., you will have a wine tasting of Txakoli and Rioja wines. And on Thursday evening you will enjoy a “Gastropote” at the fresh food market of San Martin. This package includes 20 45-minute lessons per week. This is the best way to combine language studies and activities. You will have four lessons per day from Monday to Friday. Lessons for all levels are offered, from A1 to C2. All classes are held in small groups with a maximum of eight students per level and a maximum of 10 students in the summer. If you have previous Spanish knowledge, you can start every Monday. From January to May and from September to December, beginners can also start every Monday. During the summer, you can start an absolute beginner course on August 21 and combine with the gastronomic experience. You can combine this activity pack with any of the Spanish courses, group courses, individual courses, or special programs. During this week, you will enjoy a guided visit of San Sebastián with a pintxo tour. You will visit the best bars in town, where you can taste and enjoy this miniature form of cuisine. There is also a wine tasting of Txakoli and Rioja wines included. And on Thursday evening you will enjoy a “Gastropote” at the fresh food market of San Martin. San Sebastián is a city that creates an impact on account of its beauty and lifestyle. It offers extraordinary landscapes in the city center itself, with three beaches and three mountains, as well as the contrast between the Atlantic Sea and the Pyrenees. The bay of La Concha, which lies in the heart of the city, is a magnet for sun-seekers, while surfers show off their skills on Zurriola Beach. Capital of the province of Gipuzkoa and the European capital of cultural and tourist center of the Basque Country in 2016, this city of 185,000 inhabitants seduces everyone because of its own atmosphere, its architecture, the university, and the lively streets. It is a combination of modernity and tradition. Beyond the concept of sun and sand, through the year, the city offers a varied program of exhibitions, concerts, popular fiestas, sports, and international events. San Sebastián's day in January, a dance in May, the Jazz Festival in July, the Big Week Festival in August, and the International Film Festival in September. San Sebastián is the Spanish gastronomic Mecca with 16 stars in the Michelin guide. But the restaurants are not the only thing to be enjoyed here, the bars are renowned for their pintxos, an original form of tapas, accompanied by Txakoli, a local white wine, or the famous red Rioja wines. You gastronomic experience pack includes a tapas tour and a wine tasting. If you choose to stay with a family, you will also have breakfast and dinner included. Please book your flight to arrive at Bilbao Airport (BIO), San Sebastián Airport (EAS), or Biarritz Airport (BIQ). Transfer from and to these airports is available upon request. There is an hourly service bus from Bilbao Airport (BIO) to the central bus station in San Sebastián. Bus service from San Sebastián Airport (EAS) is also available to the city every 20 minutes. Another option is taking a bus from Madrid or Barcelona. All main European cities have trains to San Sebastián. You can travel to San Sebastián from any point in Spain with RENFE. You can also take the high-speed train, or TGV, from Paris to Hendaye. Tandem San Sebastián can pick you up from the Hendaye train station at an additional cost. You can also take a travel on a train by Euskotren from Hendaye to San Sebastián. Airport: Bilbao Airport Airport transfer available: Bilbao Airport (US$180 per person) Additional charges may apply. You can request this in the next step. Airport: San Sebastián Airport Airport transfer available: San Sebastián Airport (US$84 per person) Additional charges may apply. You can request this in the next step. Airport: Biarritz Pays Basque Airport Airport transfer available: Biarritz Pays Basque Airport (US$101 per person) Additional charges may apply. You can request this in the next step. A reservation requires a deposit of 100% of the total price. The deposit is fully refundable if the booking is cancelled up to 21 days before the arrival date. Tandem San Sebastian offers Spanish courses adapted to the needs and levels of each student. Their activity pack allows you to combine Spanish with surfing, cooking, or cultural experiences. For this organizer you can guarantee your booking through BookCulinaryVacations.com. All major credit cards supported. I would like to receive the BookCulinaryVacations email newsletter, including special Culinary Vacations offers and giveaways. Show this Culinary Vacation to your friends.